In 1614, Brian Cooke, ‘gentleman’ of Doncaster, complained to the Court of Star Chamber that Thomas Bevett, Original Bellamy, and twelve others, ten of them musicians, had defamed him. 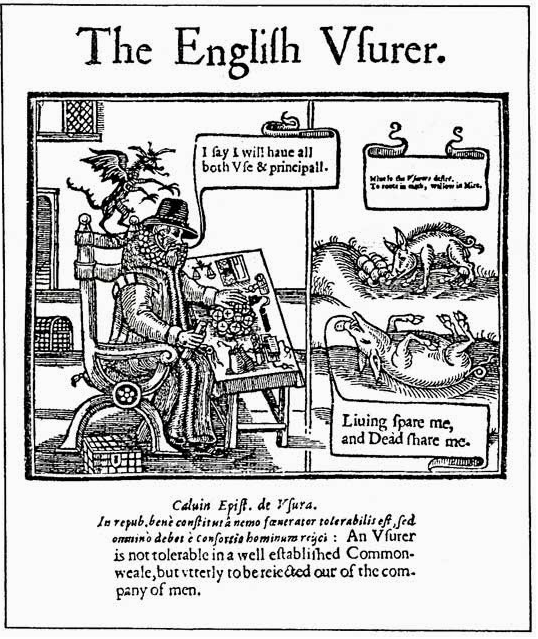 Motivated by “a long conceived and undeserved mallice” against him, the defendants, Cook claimed, conspired together to bring him into “disgrace, shame and reproche in the world.”* They tried to do this by means of a libellous poem which, over the course of four months beginning in November 1613, Bevett, Bellamy and their collaborators distributed, sang, and read aloud privately and publicly, in various places in Yorkshire and Nottinghamshire. The home towns of the musicians were probably the places where the libel was performed, with John Still’s inn being the specific venue in “Tuyworth” (Torworth), in north Nottinghamshire. The English usurer; or usury condemned, by the most learned and famous diuines of the Church of England…’, 1634 (Folger Shakespeare Library STC 3129). The poem, which consists of twelve eight-line stanzas, portrays Brian Cooke as a usurer and a thief—he, in the words of the refrain, is “The Devil of Doncaster.” We do not know what occasioned the dispute between Cooke, Bevett, and Bellamy, but others had felt the pinch of Brian Cooke’s sharp practices. In 1610, George Shepperde stated the terms of the loan he had received, rejected Cooke’s summary of them, and then averred “that the said Compleynant goeth aboute to make a praye of the defendant ” (Cooke v Shepperde, C2/JasI/C25/10). Of the defendants, Original Bellamy at least might well have defaulted on a loan from Cooke. He seems to have been a young gentleman in need of money: by 1618 two defendants in “Bellamy v Fretwell” deposed that this case was merely a vexatious attempt by Bellamy to “releeve his desperate and decayed estate” (STAC 8/71/7). These stanzas identify the very thinly disguised target of the piece. ‘Bryanus’, an invented counterpart to mythological Briareus, names Brian, and he is, of course, the “raveninge Cooke” of the following verse. Transcription and translation by Ted McGee, University of Waterloo, 8 March 2016. Map of Yorkshire showing location of Doncaster, etc., c.1600. *Unless otherwise noted, all quotations are from Bevett v Cooke et al. (STAC 8/113/3). All the documents quoted are in the collections of the National Archives, Kew. In the quotations, brackets indicate the extensions of abbreviations in the manuscripts. This month’s Flower is very kindly provided by Ted McGee, editor (with Sylvia Thomas) of the REED West Riding volume.